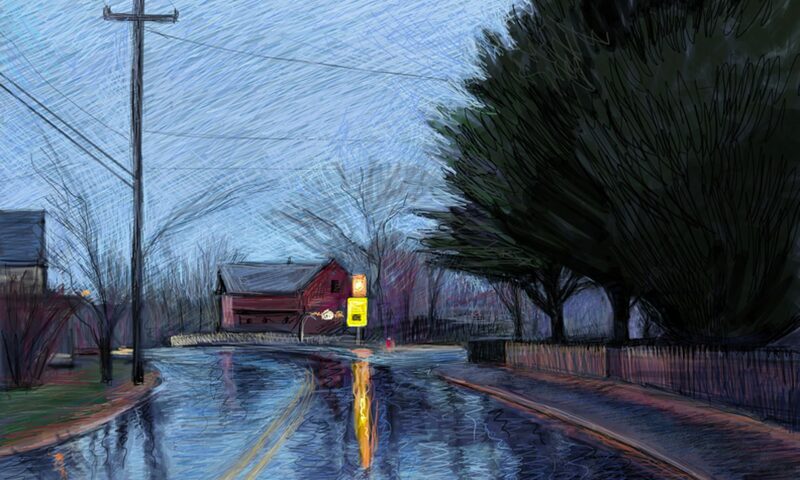 I am drawing using an wacom intuos tablet, a stylus, and Painter 15 software. 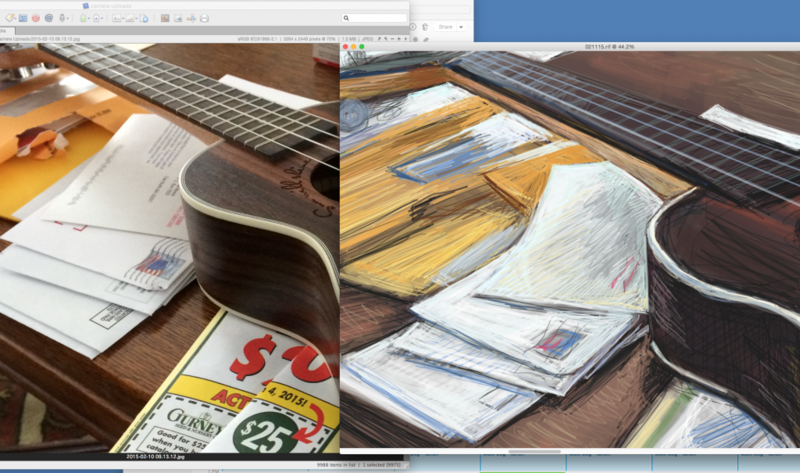 Here are screen shots from a drawing in progress, February 11, 2015. My computer screen is large enough that I can easily view my reference photo beside the drawing canvas, which facilitates sketching from it. For this drawing, I created a dark brown canvas to start. I then created a new layer and started a rough sketch with the fine point pen brush. I use the fine point pen brush for the whole drawing. Once I have a rough sketch of the composition, I start blocking in solid colors on a new layer. I work with an opacity of around 30 on these brushes, so that the background canvas shows through. As I start adding in details, I create new layers for each grouping of details. 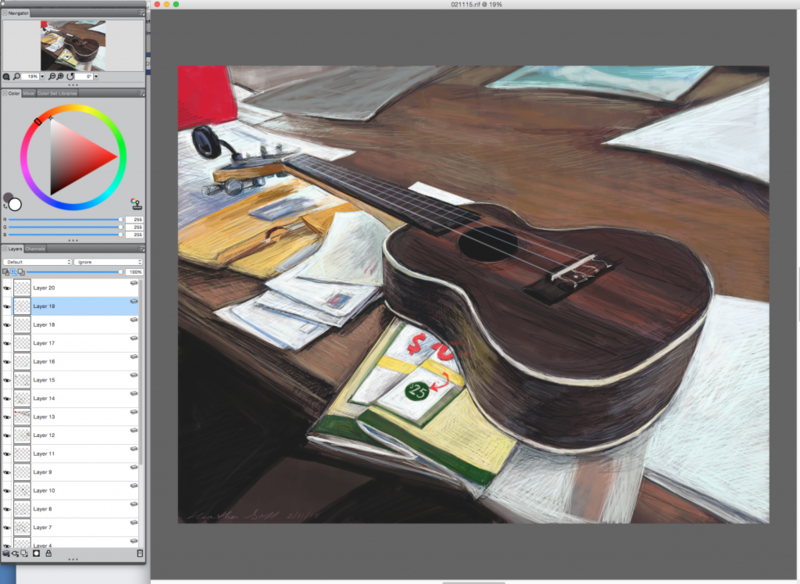 I added the ukulele strings on their own layer. 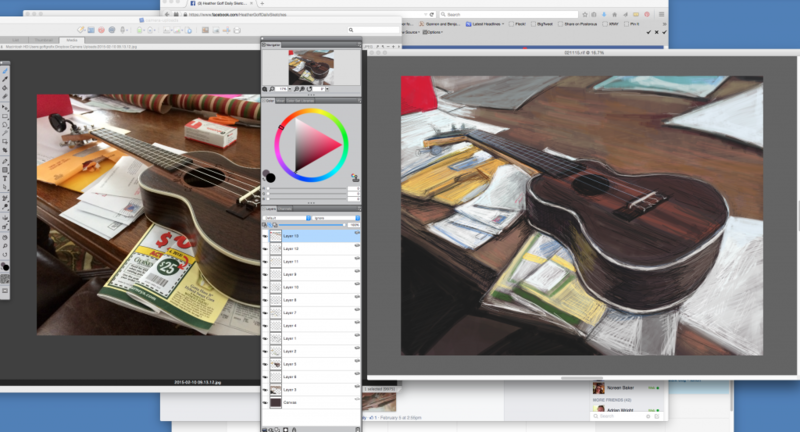 With the brush tool in painter, one can choose straight edge or free hand. Most of the drawing uses free hand, but for the strings and edges that truly need to be straight, I switch to the straight edge brush. By drawing the strings on their own layer, I can draw/paint under them if I need to add colors to the fret or body of the instrument. This screen shot below shows my layers at this point. The sketch is still very rough. At this point I zoom in to the photograph, and in to my canvas so that I can put in more detail and clean up the scribbly-ness of what was put down from the more distant view. My eyesight is not great, so being able to zoom in to view the detail is an amazing luxury. This shows all the layers that I was working with at this point in the drawing. The beauty of working in layers is that you can draw under a layer that has already been created, or manipulate the opacity of a layer, or turn it off completely. The process is very facile.